Heat Pumps are a popular and energy efficient way of heating a home. energy BY DESIGN are an MCS Accredited Company allowing you to take full advantage of the Governments Renewable Heat Incentive scheme. We can offer bespoke installations and will advise you the best for your needs rather than a ‘one size fits all’ approach. An air source heat pump harvests the energy from the ambient air temperature and can even function down to -20ºC. It is connected to the domestic heating system by a simple flow and return pipe and just requires an electricity supply. A ground source heat pump works on the same principle but obtains its energy from ground coils or ground water. 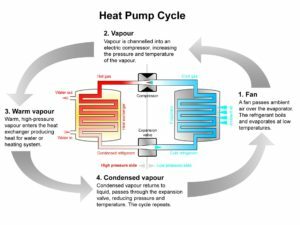 A heat pump works on extracting latent heat energy from either water or air and moving it across an evaporator. Inside the evaporator is a refrigerant which boils at low temperatures. A compressor compresses the hot gases until they reach high temperatures and high pressures. Once in this state they pass over a heat exchanger (known as a condenser) and it is here which we gain our usable heat energy. We now have a lower temperature refrigerant at high pressure. It then enters a pressure relief valve and turns back into an (almost) liquid state. This cycle is then repeated. With conventional boilers 1kW of input energy provides less than 1kW of output energy or heat. A heat pump can convert up to 4kW of output energy from 1kW of input energy. Therefore a heat pump is up to 4 times as efficient as a gas or oil boiler. It is the natural choice for low cost heating and hot water. With the Governments Renewable Heat Incentives (RHI) a heat pump should be eligible providing certain criteria are met and the customer will receive a payment for every kW of renewable heat produced. To find out more see F.I.T.S and RHI. 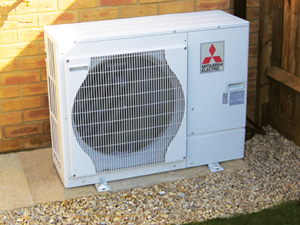 Heat pumps are ideal for non gas grid areas having no gas supply, flue or room ventilation requirements. Click here for a short video bought to you by Mitsubishi Electric.